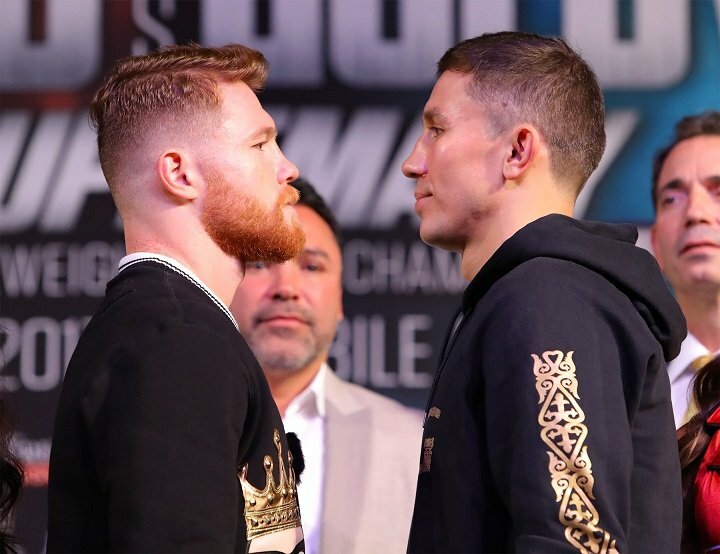 By Dan Ambrose: The rematch between Golden Boy Promotions star Saul Canelo Alvarez and K2 knockout artist Gennady ‘GGG’ Golovkin for May 5th could be heading back to Las Vegas, Nevada, as that city is now the favorite to get the second fight. The venue will be decided in the next 2 weeks for the Canelo-GGG fight. New York and Dallas, Texas are the other 2 possible cities where the fight will take place, but Golden Boy Promotions are leaning in favor of bringing the fight back to Las Vegas. That’s not a good deal for Golovkin, because the scoring by 2 of the 3 Nevada State Athletic Commission assigned judges for the first fight against Canelo prevented him from getting the victory. The judges scored the Canelo-Golovkin 1 fight a 12 round draw last September, and it was very controversial. Golovkin appeared to win. Golden Boy Promotions president Eric Gomez says Las Vegas has the advantage over the other states/cities that want to stage the Canelo vs. Golovkin rematch. That’s bad news for Golovkin, because Canelo is a regular for Las Vegas. Canelo has fought in Las Vegas 10 times during his 13-year pro career compared to only 1 time for Golovkin, who found himself on the receiving end of questionable scoring by the judges for the Canelo fight. •	Julio Cesar Chavez Jr.
Canelo means a lot to Las Vegas. There’s no question about that. He brings a ton of money to the city each time he fights. You have to think that Golovkin’s promoter Tom Loeffler should have held off on signing an agreement for the rematch with Canelo until he found out WHERE the second fight would take place. Waiting until the rematch with Canelo was signed before working on the venue for the fight could prove to be a mistake by Loeffler. If Golovkin has no choice but to fight in Las Vegas again, it could put him in the same situation he was in last time in terms of the scoring for the fight. Canelo is from Mexico, but Las Vegas has become his preferred city for fighting. Vegas is NOT the place where Golovkin prefers to fight. He’s built up a huge fan base in New York, but that doesn’t appear to be where the second fight against Canelo will take place. “The special thing that is already the end (of week) of the Cinco de Mayo in Las Vegas is incomparable,” Gomez said to ESPN Deportes. “Today I can tell you that Las Vegas has an obvious advantage over other cities but the important thing was to reach an agreement and today we have it,” Gomez said. If Golovkin and Loeffler can insist that the rematch with Canelo be staged at a place where there’s less negative history behind it, then they can possibly get the fight to take place in Texas or New York. It obviously doesn’t bother Canelo to fight in Las Vegas again, because the scoring by 2 of the judges saved him from a loss last time he fought Golovkin. Look at the scoring by 2 of the judges: 118-110 for Canelo and 114-114 even. The 114-114 score seems fair to some boxing fans until you look at the fact that the judge that turned in that score gave Canelo round 7, which was the most lopsided round of the fight in favor of Golovkin. That was arguably the easiest round of the fight to score in Golovkin’s favor, and that judge gave it to Canelo. If the judge gave it to Golovkin, as the other 2 judges did, he would have won the fight. With scoring like that, you can understand why Golovkin doesn’t want to go back to Las Vegas. The place has a negative history for Golovkin. “Las Vegas offered us a great deal the last time, but we must listen to their plans,” Gomez said. New York has taxes that could prove to be a negative for the Canelo vs. Golovkin 2 rematch. Texas would be great, as they don’t have a state tax. It’s like Nevada with no state tax. Loeffler likes the idea of staging the rematch at the Dallas Cowboys Stadium in Arlington, Texas or at Madison Square Garden in New York. Obviously, that’s not where Golden Boy wants the Canelo vs. GGG rematch. Golden Boy is still deciding whether there will be a press tour to different cities or not. They had press tour for the previous Canelo-GGG fight, but they opt to skip it this time around due to the tours being costly and there might not be a need for one. The boxing public is already familiar with Canelo and Golovkin, and there’s less need to try and sell the fight to them like there was for the last fight. The fans have likely already decided whether they want to pay to see Canelo and Golovkin fight again by now. With the controversy due to the judging of the fight from last time, it wouldn’t be surprising if the Cnaelo vs. Golovkin rematch fails to bring in the same PPV numbers as their September 16 fight. It’s never a good thing when the scoring of a fight becomes the main focus rather than the fighters themselves. If the rematch takes place in Las Vegas and once again the judging leads to another controversial outcome, it could be a black eye for the sport of boxing.